hiya my sweets i have had to re write this because dunno what i did but you couldnt read my waffle..mmmm perhaps thats a good thing eh!!! anyway another week has passed so quickly and been so busy..but it keeps me going ive been re graded and now im level 2 in management which has incurred a pay rise WOOOPPPPPIE!!! to have your entry card with connection to a song mine is Schools out Alice cooper,,,you i dont think you have to leave the person who sang the song but it would be nice to give us a clue lol!!!!! Lily of the valley our sponsors have kindly donated a £10 gift voucher how fabulous!!!! Smashing card as usual Trout!! Hope you've woken up now after seeing me flowers!!! Worraya like eh!! I'll tell yer what, you and Promarkers make a bloomin' good team me old mucker! (Loving that pencil in the ribbon). Clever! Congratulations on yer promotion!! Well deserved Trout. 'Bout time too I say! Loves ya!! Such a cute card Sassy!! Oh sure ... now I'll be humming that song the rest of the day! LOL! 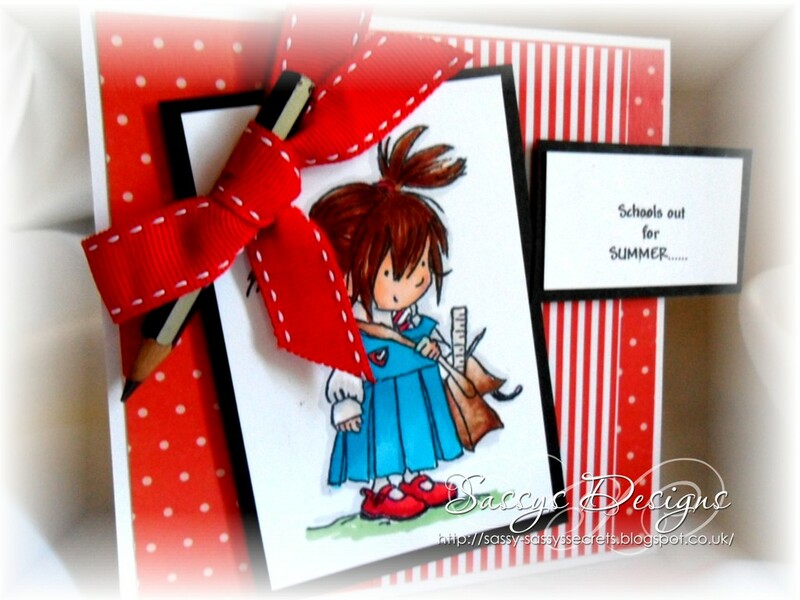 Your card is ADORABLE and I agree with Rita ... WOW that coloring is perfect ... I need some lessons! Congrats on the upgrade & pay raise! Have a FAB weekend my friend. I'm heading out to spend some time with my Mom then spend the night with an old high school friend and we are going on a Historical Tour of our hometown area tomorrow ... should be great fun! fantastic card Sassy, love the image and the song matches perfectly - and that little pencil is a gorgeous finishing touch! 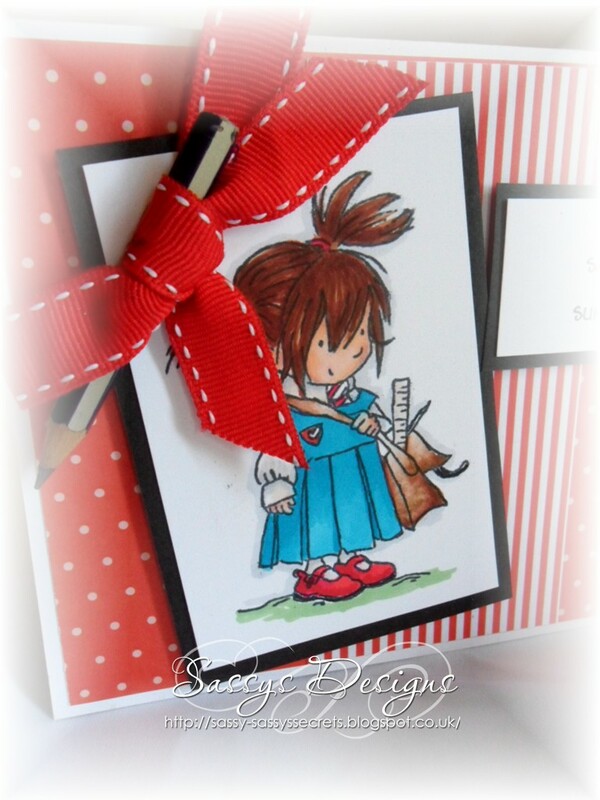 Gorgeous card Sassy, I like the sweet image the colours and pencil through the bow. This is just wonderful! Love your card especially the added pen, so cool! what a cute cute card! I love the red & blue!! !